Location: Ardglass, County Down, Northern Ireland. Ownership / Access: Private. Not open to public. Notes: Jordan's Castle, is a castle situated in Ardglass, County Down, Northern Ireland. 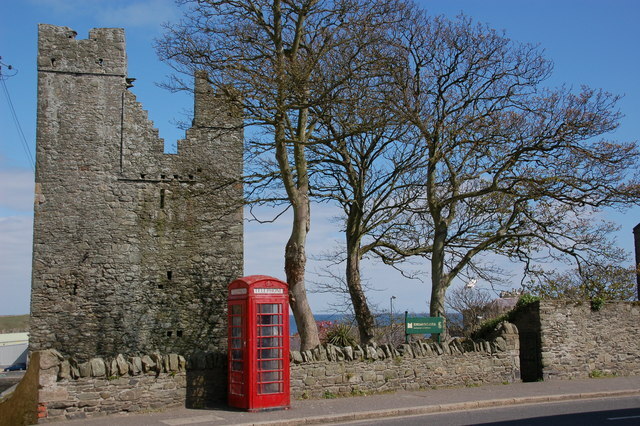 The tower house known as Jordan's Castle is a State Care Historic Monument sited in the townland of Ardglass, in Down District Council area, at grid ref: J5601 3713. It stands close to the junction of Kildare and Quay Streets in Ardglass and commands the harbour. Its early history is somewhat obscure. The earliest authentic reference is to a defence of the castle by Simon Jordan against the O'Neills for three years, until relieved by Lord Deputy Mountjoy in 1601. The 18th century historian, Harris, says that "it is most probable that Jordan's Castle was erected by one of the family, whose arms (a cross and three horseshoes) are fixed in a stone near the top". In 1911 the Belfast antiquarian, Francis Joseph Bigger, bought the castle and restored it, using it to display his extensive collection of antiquities and making it freely accessible to everyone to bring local people 'into touch with the Irish past, and give them some conception of the historic background of their life'.It was also extensively used for get-togethers of the wide circle of Irish Cultural revival artists and writers to whom Bigger was friend and patron. Following suggestions by Alice Stopford Green and the archivist Henry Egan Kenny, Bigger renamed the tower 'Castle Séan' in honour of the two years when Shane O'Neill controlled Ardglass, and they believed, re-fortified the tower following his defeat of the MacDonnells at Glentaisie in 1565. When he died in 1926, the castle was presented by his executor, Dr Joseph Bigger, to the state on condition that, with its contents, it should be preserved as an Ancient Monument. The contents have since been dispersed among the Ulster Museums general collections and the tower is no longer open to the public. Ardglass had at least six castles and remains of four of them can still be seen: Ardglass Castle, Cowd Castle, Margaret's Castle and Jordan's Castle.